This Clematis is absolutely stunning for its large fully double or semi-double flowers which are produced during May and June followed by single flowers in September. These can vary in colour from silvery-lilac-mauve, through lilac to lavender-blue or dark pinkish-lavender tinged purple or red. 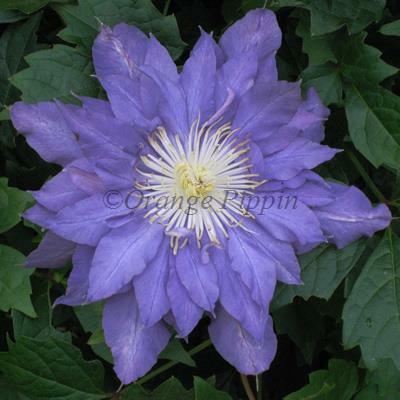 Clematis 'Vyvyan Pennell' was raised by Walter Pennell of Pennell and Sons nursery and named in 1959 after his wife. Clematis 'Vyvyan Pennell' is of compact habit, making this non-evergreen climber an ideal candidate to be planted in a container on the patio, supported by bamboo canes or an obelisk or grown against a trellis, garden fence or wall.